This Saturday I hosted the first ever Om-Nom Acres event. We had gorgeous November weather! Eight people turn out in total, including those who live in the house: Devin, Sammit, Katie, Hanuman, Lisa, Mike, Chantel, and yours truly. Devin and I started our work nearly a month in advance, planning materials, tasks, food, etc. I put her in charge of shopping and prepping food while I worked on getting all the materials to the house. On Friday, Devin and I worked through all the daylight hours, moving cement blocks from the six pallets in the driveway to the back yard where we level the soil and lined them up according to a rough plan. We managed to build and fill the garlic bed with compost. We also built half of the garage parameter bed. When it was too dark to work outside we ran errands, picking up equipment from my in-laws (a wheel barrow and a 3 piece crock-pot set), and straw bales from the garden center. When the stores closed we cleaned the house and picked up a few of our hearty volunteers who don’t drive so they could spend the night with us. We all fell into bed around 2AM after stretching and soaking in epsom salts. We started Friday with eggs and coffee. Devin, Hanuman, Katie, Lisa, and I worked in the chilly sun. We moved more concrete blocks and compost. We double-dug the ground, extracting and heaving chunks of brick and stone as we unearthed them. We spread leaves and straw, and replanted the perennial herbs. When the sneaking hunger could no longer be ignored we broke for lunch, a spread of salads, meats, and potato products, and warmed up on cider. In the afternoon, Mike, Sammit, and Chantel joined us and our productivity increased exponentially! Mike helped me address some structural concerns (like how to prevent all of this work from heaving during the winter or washing away in the spring). As a result, Mike and Hanuman took turns war-hammering over 700 inches of reinforcing bar into the ground through the holes in the blocks, a task that left them bruised, swollen, and shaking. These people are tough. We worked until the light gave out on us, just before 7PM, and came inside to a warm taco bar and chocolate pudding! We sat in the living room, talked, laughed, received updates on the football game (sorry MSU! ), and ate delicious food. Several people went home, but a few stayed and we massaged each other’s aching feet, hands, and back while drinking beer and watching documentaries on Netflix. It was the most fulfilling two days I have ever had. And the best sleep I have had in years. On Sunday we rested. Throughout this week we still have compost to move, but we’re taking it slow. We’ve placed 300 blocks and have 150 remaining for a potato bed, an asparagus bed, and a cold frame. 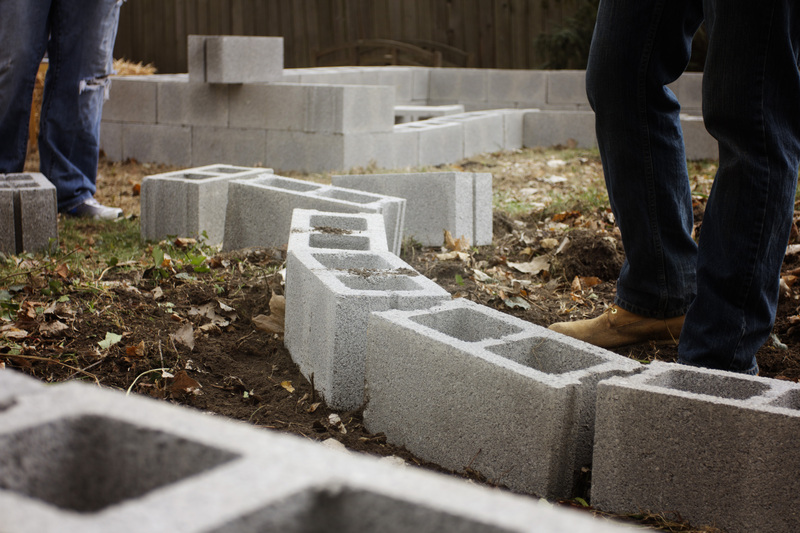 The blocks measure 8x8x16 and each contains two “pockets” roughly 6×6 for additional planting. We bought so much food! This provided 3 full meals for most volunteers and we have leftovers for the whole week! I would say it actually cost us no more than 1/2 to feed everyone so really = 124.63. The remaining 10-15 will be finished by this coming weekend between three people. There were 6 primary jobs and people were encouraged to take frequent breaks and change jobs to avoid too much strain on their bodies. Block Mover: Used the dolly to move 5-10 bricks at a time from the driveway to the building areas in the back yard. Bed Builder: Used the flat head shovel and additional compost/dirt to level the ground and place blocks appropriately to build beds either 1 or 2 levels high. Must know the bed layout plan and pay attention to detail. Bed Prepper: Used spade head shovel to “double dig” the ground in the beds and spread leaves and straw over bed areas. Compost Mover: Loaded and moved compost from the pile in the driveway to the appropriate location in the beds (on top of double-dig, leaves, and straw). Block Filler: Used a shovel or hand spade to fill the 6×6 holes in the edges of the beds. Reinforcer: Used sledge hammer to pound in reinforcing bars at 2-level-bed corners and 1/2 way between corners. We all kept house, taking care of our own dishes, and feeding ourselves or helping others navigate the kitchen. We added 591 square feet of gardening space to the garden (+ the 101 square feet we had before) for a total of 692 square feet for growing in 2013! I’ll have to see how the beds hold up over the winter and spring with the rebar. If they need more reinforcing, I will make sure to post an update on what we plan to do. Invest in good gloves. The gloves I linked to in the materials section are the best work gloves I have ever used. They fit well, kept our hands warm but not too sweaty, and provide great protection from and grip on the handles and cement blocks. We are keeping ours around so anyone who wants to come help will have them. Without them, we all would have been toast in a matter of hours. I overestimated on the bricks, which is a good thing because a few of them came broken (2), I didn’t want to have to interrupt the workflow to go buy more, I will find a use for them, and they don’t “go bad”. I underestimated on the compost because I didn’t want to be overwhelmed and pay for more than I could move before it rained (advice from my mama). I can always buy more in the spring if I need it, when it will have a bigger effect on my crops. I overestimated on the food because I knew those of us in the house would eat the leftovers and I did NOT want my amazing volunteers to feel they couldn’t eat or drink as much as they damn well pleased. The beds do not look exactly the way I had planned on the computer (though they are close), and that’s okay! It was really hard for me to get a good grasp of size and space from the screen to the backyard. 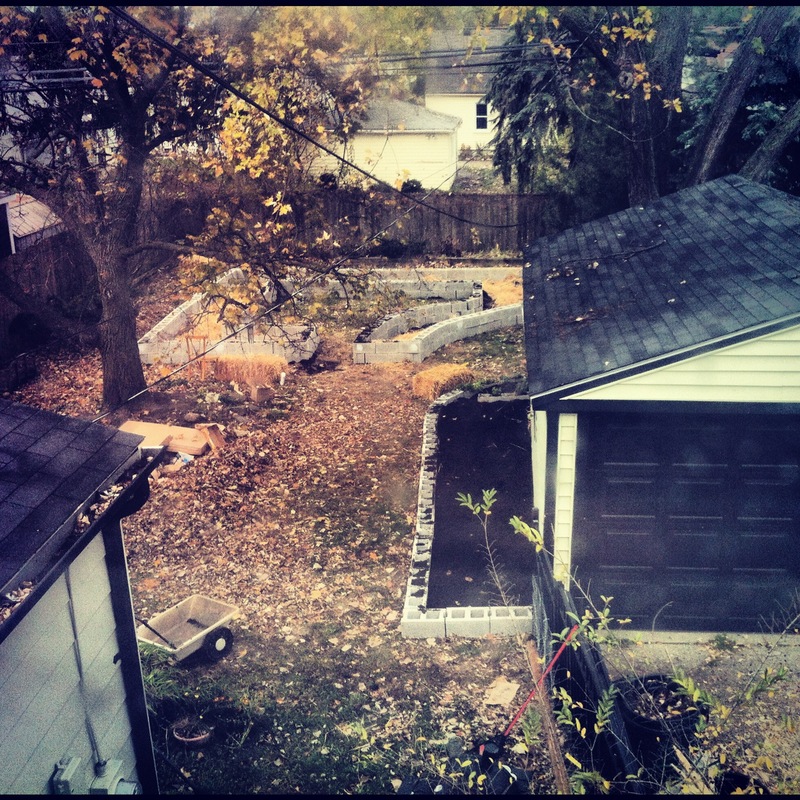 We went with the flow of the yard, including making some adjustments for huge and unmovable underground tree roots. If this is your project, take frequent breaks so you don’t wear out before your volunteers (no one likes being hosted by a zombie). Also, encourage your volunteers to take frequent breaks, hydrate, and switch jobs to avoid boredom and repetitive motions on the joints and muscles (injuries!). Make sure it is clear that people should not push themselves and everyone’s safety is important. Stretch during breaks and when you close up for the night. I’m convinced stretching combined with soaking in an epsom salt bath helped me do this for two days in a row and still walk to class on Monday without anyone being suspicious. I’m looking forward to more photos! I’ll take notes for my future backyard garden. Thanks ladies! I’m super excited too! I’ll make sure to post more pictures as I get them. I can’t wait until its full of green. I am completely heartbroken that I wasn’t there.